Hmmm, 2 months ago was my last post. Time flies and I don't know why, just didn't feel like blogging. But I will give it another try. 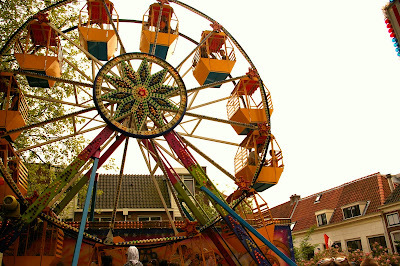 Today we celebrated queensday here in Holland, we had such a lovely day, nice weather, we when to Delft and we loved it. 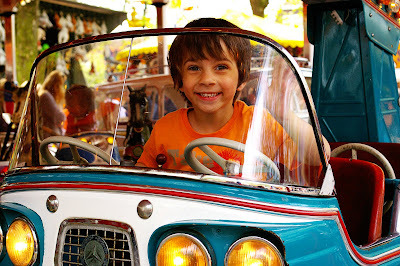 we went to the flea market and bought some toys together with Camiel. 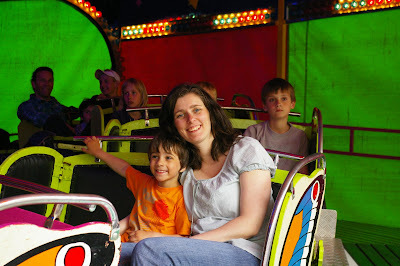 We also when to the fair, Camiel loved it and wanted to do every ride. Here some pictures. But when we got home we saw the horrible news that somebody attempted to attack the royal family with a car. 5 people died and there are also seriously injured people. Unbelievable, I just got chills when I saw the footage on TV, horrible. This are my lastest Lo's of this week. 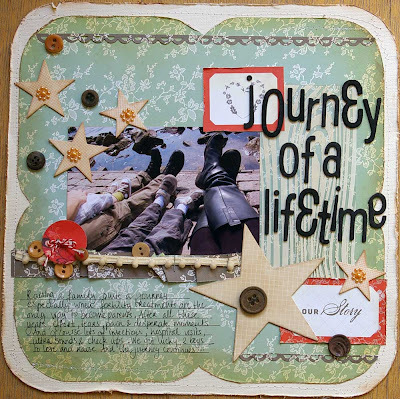 This LO I made for the OLW challenge of this week: Journey. I still managed to do all the challenges this year, I really love them, they get me to do other LO's, about special subjects. 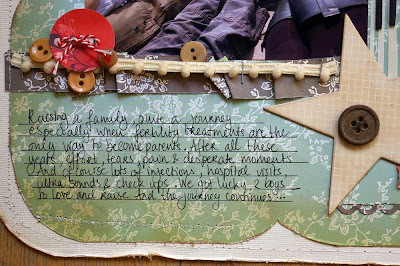 Here I journaled about the journey of a lifetime, about becoming parents and raising our sons. Loved that i made this picture of all our legs at the watersite during a walk in the parc, 1 of the first sunny days of this spring. Used the Jack&Jill Studio Calico kit. 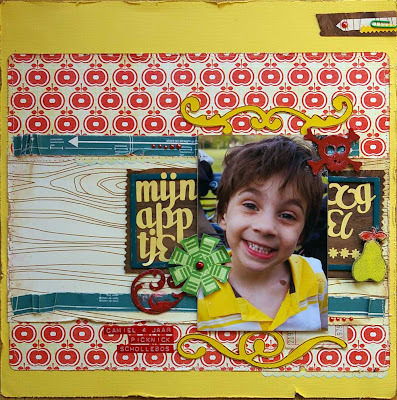 Again a wonderful kit, love the colors and the invisble chipboards (Heidi Swapp) are so much fun. Finally used my vintage buttons from France. Next time I'll try to show so older LO and the projects I made during of the scrap-a-licious weekend. Gave layouts heb je weer gemaakt! En leuke foto's van Koninginnedag.Vreselijk inderdaad wat er gebeurde. Mijn vriendin en ik zijn ook geschrokken toen we tijdens Koninginnedag hoorden wat er was gebeurd. Ze belde haar ouders die aan het oppassen waren en we konden het eerst niet geloven. De rest van de middag hebben we TV gekeken. Wat een ellende, wat afschuwelijk! Jij mag dan achter lopen met bloggen, ik loop achter met blogs bezoeken! Maar daar komt verandering in - ik heb nu alle blogs die ik vaker wil bezoeken in mijn favo's gezet en de jouwe staat erbij dus uuuuhhhh: nu wel regelmatig bloggen dus! Tot snel! Wat een gave LO's heb je gemaakt Astrid! ook een super foto op die laatste!! lees ze altijd hoor. Mooie lo's weer, ik mail je binnenkort even ! Wat gaaf dat je gast-designer bent bij MLS! Helemaal leuk en vooral helemaal verdiend. You go girl! !